Come join us for a cooking demo at Chef Supplies by KaTom. 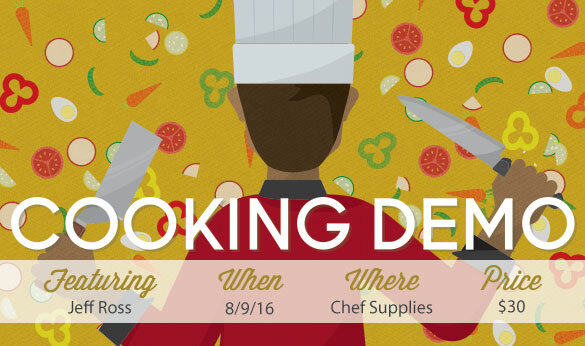 We offer cooking demos every other week that feature chefs from all over the region. During each class, chefs present new techniques, delicious recipes, and quite a bit of entertainment. Whether you have a list of questions for our guest chefs or you’re just looking for a casual night out with friends, we hope to see you soon at Chef Supplies by KaTom. Jeff Ross, Garden Manager at the famed Blackberry Farm, will be here on August 9th to show off his skills in the Chef Supplies kitchen. Jeff has been at Blackberry for 10 years, but has always been passionate about what grows in the garden and how to use those products in the kitchen. When you can’t find him in the garden, he is probably in the kitchen creating new dishes with the organic herbs and vegetables that he grows. For more information or to RSVP please contact us at Chef Supplies by KaTom at 865-225-1559. This is a bring-your-own beer or wine event. Copyright© 2001-2019 KaTom Restaurant Supply, Inc. All rights reserved. The KaTom Blog is dedicated to aspiring entrepreneurs, food lovers, and chefs as passionate about food as we are. Visit KaTom.com to learn more. Visit KaTom Restaurant Supply's profile on Pinterest.